Although Dean are more associated with heavy rock and metal, they have a real talent for making some stand-out acoustic, classical and – in the case of today’s review – resonator guitars. This Thinbody Cutaway – the RESCEHB – is an electro-acoustic resonator with a bold vintage design, superb comfort and big character. It comes in at the higher end of our chart on the best resonators, meaning a higher price tag. Worth the cash? Let’s find out! 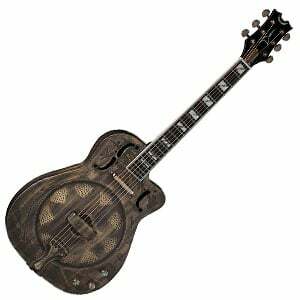 Even though we’ve said Dean are no one-trick pony and have a scope outside of rock and metal, this thinbody resonator may well appeal to guitarists making the move from electric to resonator, as the 24.75” scale length body is familiarly slim and comfortable (if a little heavy). As the name suggests, it has a cutaway on the treble side offering good access to the higher areas of the 19-fret mahogany neck. The woods end at the neck, as the body is made from iron, plated with an attractive aged brass with two f-holes on the upper bout. This plating features an embossed serene desert island scene (more visible on the rear of the body), complete with palm-tree and ocean. You can almost taste the coconuts! Returning to the neck, you’ll also find a rosewood fretboard, with pearl and abalone block inlays. It’s a roundneck style, with a comfortable C shape and low action, so is played in a regular position instead of lap steel style – another reason electric guitarists would enjoy giving this baby a go. The Thinbody Cutaway is a single cone biscuit-bridge resonator, with a brass coverplate that matches the body. It’s also loaded with electronics, which include two pickups – a DMT-designed lipstick pickup at the neck, with a piezo pickup at the bridge. On the lower bout, there is an individual volume control knob for each pickup, along with a separate blend control. These golden knobs feature abalone tops, and just look awesome. 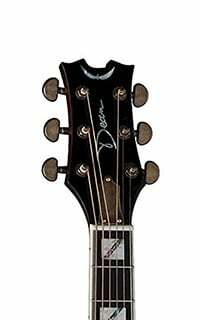 Up top, on the distinctive Dean winged headstock, you’ll find a set of sealed die-cast tuners, which are pretty high quality and work well for this guitar. There’s no ‘one sound’ from this thinbody, as it depends on your playing style and the blend you use, but the tonal range is huge – especially when plugged in. For example, some fantastic twangy, metallic sounds are on offer when strummed or plucked with a little gusto, although it can be equally smooth when played gently. The pickups are decent – very articulate and prove versatile thanks to the blend control, which allows you to dial in the ideal sound to suit your playing. While tradition isn’t the first word that springs to mind, Dean have crafted a real performer’s guitar, with that eye-catching aged-brass look, slick playability, and a versatile palette of sounds. 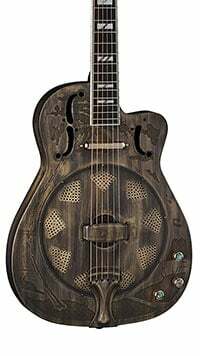 It’s certainly one of the best choices for electric guitarists wanting to try a resonator and, from bluegrass to rock, you should be able to find a tone that suits your playing. For more info about the Dean Thinbody Cutaway Resonator, click here.